One of our favorite memories from our Greece/Italy Honeymoon in 2011 was the time we spent in the wine bar at Locanda San Francesco, our bed & breakfast in Montepulciano, Tuscany. Check-in for the B&B was actually in the wine bar, and we were greeted with a complimentary drink and snack when we arrived. The wine list at the bar features a selection of local wines, most notably the famous Vino Nobile di Montepulciano. There is an option to enjoy a glass, a bottle, or even a tasting flight. We loved the wine, but the ambiance is what is most memorable. We not only returned for the experience the night of our arrival, but also each of the following four nights. The wine bar includes a small bar as well as several tables, armchairs, and coffee tables. We usually opted for the comfortable arm chairs. The bar’s clientele included guests from the 4 rooms at the B&B, other tourists visiting Montepulciano, and several locals. Small snacks, such as nuts and olives, were served with each drink order. There was also a small food menu served during lunch and the evenings. We actually opted for dinner at the Wine Bar one of the nights, and were very satisfied with the quality of food. We met many interesting people during our time at the wine bar. The owner and the bartenders were both very personable, and shared their insights on local cuisine. We connected with several other guests at the hotel while at the wine bar, including a couple with a son working at a winery we visit in Santa Barbara Wine Country (we actually met him on our next visit!). We love staying at smaller places in Europe. It’s interesting getting to know the other visitors, and interact one-on-one with owners. Usually, the best opportunity for this interaction is at breakfast. 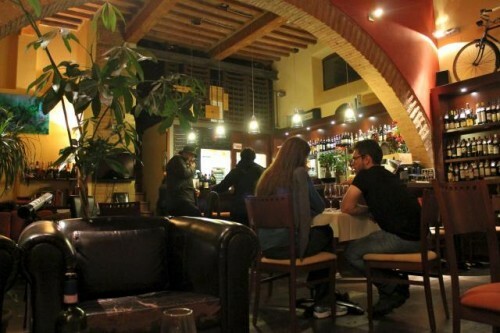 At Locanda, however, the wine bar was the ideal place to connect with other people. It’s great to have a place just downstairs from your room where you can rewind from the adventures of the day. After a long day of exploring Tuscany, returning to the Locanda for wine, a snack, and a great conversation was truly a trip highlight. This entry was posted in Travel and tagged Europe, experience, food, Greece/Italy 2011 Trip, Italy, wine tasting by Ryan. Bookmark the permalink.